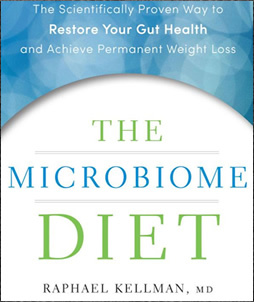 The Microbiome Diet was created by integrative medicine and intestinal health specialist, Dr. Raphael Kellman. This program includes a three-phase plan to help you balance your microbiome and heal your intestines. Once this occurs your metabolism will be restored, which will automatically lead to healthy weight loss. Load up on the foods that heal your gut and support your microbiome. Avoid the foods that challenge your gut and imbalance your microbiome. You will enjoy a wide variety of fresh fruits and vegetables, healthy fats, and lean proteins. However, your main focus will be on superfoods, spices, and supplements that have a special ability to heal your gut and support weight loss. Replace stomach acid and digestive enzymes. Reinoculate with probiotics (good bacteria) and prebiotics (substances that feed the healthy bacteria). Repair the lining of your intestinal walls. Processed and packaged food, trans and hydrogenated fats, dried and canned fruit, fruit juice, gluten, all grains including rice and quinoa, sugars and artificial sweeteners, dairy products and eggs, deli meats, peanuts, potatoes, sweet potatoes, legumes, iceberg lettuce, canola oil, alcohol. Follow this plan for the next 4 weeks to give your metabolism a boost. After completing phase 1 your intestinal tract and microbiome is stronger. So you have a little more flexibility in the second phase. Now you only have to maintain 90 percent compliance to the meal plan. That means that 3 or 4 meals each week can contain something that is not on the recommended food list. You can also include some free-range eggs, organic dairy products, gluten-free grains, legumes and sweet potatoes in your diet. If you still have weight to lose you can follow this plan until you reach your goal. You should also be able to maintain your weight loss using this approach. In the final phase you only need to maintain 70 percent compliance. The other 30 percent of the time you can eat almost anything you want. However you should continue to avoid processed foods and unhealthy ingredients such as trans fats and high-fructose corn syrup. It is also recommended to limit gluten and sweeteners -other than Lakanto – to no more than twice a week. Lakanto is a calorie-free sweetener made from sugar alcohol and can be used in moderation throughout the program. It doesn’t raise your glucose or insulin levels. Wild salmon, grass-fed meat, free-range eggs, goat’s yogurt, sheep’s yogurt, fermented vegetables (sauerkraut and kimchee), asparagus, carrots, garlic, Jerusalem artichoke, jicama, leeks, onions, radishes, tomatoes, avocado, apples, cherries, coconut, almonds, cinnamon, turmeric, lakanto sweetener. The Microbiome Diet: The Scientifically Proven Way to Restore Your Gut Health and Achieve Permanent Weight Loss retails at $25.99. The program also requires the use of a variety of nutritional supplements, which may become expensive. Encourages consumption of a variety of fresh, unprocessed, organic foods. May provide relief from a wide range of health conditions including digestive disorders, chronic fatigue, low immunity and arthritis. Provides an alternative for dieters who have been unsuccessful with conventional weight loss programs. Does not involve calorie counting or measuring portions. Includes five weeks of meal plans with recipes. The first phase is very restrictive and requires elimination of a variety of foods. Dieters may experience fatigue and other detox symptoms for the first week or two. Requires a wide variety of different nutritional supplements. The Microbiome Diet helps to repair your digestive system and rebalance intestinal flora. This can result in improvements in general health, energy, mental function as well as natural, healthy weight loss. While no calorie counting is required, calorie restriction will occur naturally because of the very low carb nature of The Microbiome Diet. This will encourage weight loss more so than having the right balance of microbes in your system.